For some people…a lot of people…there’s nothing better than a quiet afternoon of television, especially if it can be enjoyed with the family. However, as shows get darker and more complex with every passing year, it’s hard to find something in the modern age that really sticks with you – something that’s more than simply the latest TV fad. Even so, timeless, memorable programming can be found, especially with a saga like Star Trek. For decades, the Trek universe has inspired the imaginations of millions, even sparking an interest in the sciences within our future innovators, the children. Star Trek has endured to become a quality form of storytelling for a long time, and though part of the reason why is the fact that it suggests a hopeful view of the future, the main element that etches it into our minds is its sheer entertainment value. Here, we’ll explore notable aspects of each of the 6 main live-action Star Trek TV series. Engage. 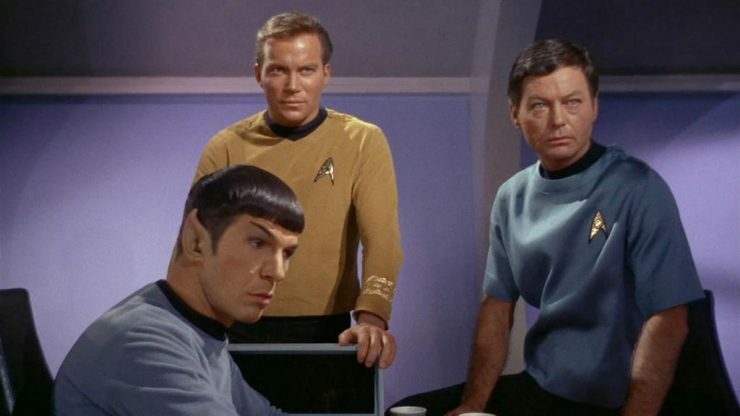 From 1966 to 1969, Gene Roddenberry’s original Star Trek enjoyed three seasons on NBC. With the indomitable William Shatner portraying a captain in the Starfleet organization of the Federation, the crew of the Enterprise warped into parallel universes, alien worlds, and high octane adventure. Though it was essentially a shoot ’em up Western set in space, the show managed to stay rather high-brow compared to other sci-fi works. This polarized people – many loved it for its thought-provoking themes on religion (see the episode “Return of the Archons” for example), classical history, and an at least conceivable exploration of space, but others thought that it was too over the top. This, along with a gradual decrease in quality, led to the early cancellation of the series in 1968, but the show gained popularity as Americans watched reruns throughout the 70s. Six successful feature films were based on this series, and a complete reboot of Kirk, Spock, McCoy, and crew was initiated by J.J. Abrams in 2009. The most interesting thing about the original series was its darkness and complexity, which allowed for intelligent stories that were basically morality plays dressed up as fantastical fiction. Set 300 years after the 60s, there was no longer any racism or sexism on the planet Earth, and every human being was shown to be equal. This even impressed Martin Luther King Jr., who told Nichelle Nichols (Uhura) that Star Trek was one of the only shows that he allowed his children to watch. The Original Series started a theme that would remain in every subsequent form of Trek – equality for all humans. After a few big screen Treks, Roddenberry resurrected Star Trek for a TV format in 1987 with Star Trek: The Next Generation. With a large crew of producers, writers, and directors, the show was probably the most polished and optimistic of the Treks. It could even be argued that it had more of an impact on the world than the Original Series. The futuristic peace envisioned in the first series (peace on Earth; there’s still war in space) was upgraded by Roddenberry, who realized that the world he created in the 60’s was loved by many for its portrayal of what mankind could achieve in the future. 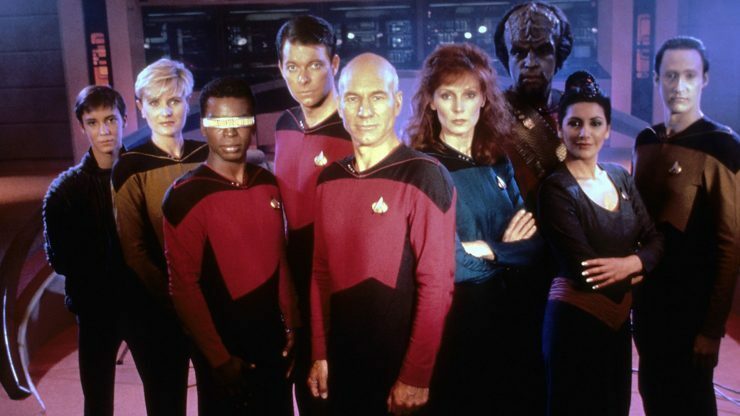 Though there are monsters, exotic worlds, and threats of alien invasion, the focus of TNG is the human element. Captain Picard often demonstrates a love for Shakespeare, Data the android tries his hardest to be human, and nearly the entire crew overcomes overwhelming odds on a number of occasions. When the show started, it seemed like a sleek clone of the Original Series, but by Season 3, originality was in full swing. This is most likely due to the actors, who, over the course of 7 seasons, seemed to slowly turn their characters into mirror versions of who they actually were in reality. Jonathan Frakes’ jovial nature is seen in his character, Riker. Marina Sirtis’ upbeat attitude is evidently displayed when she acts as Troi. And Sir Patrick Stewart’s intelligence and calm strength are clearly carried over into his Picard character. Actor and character are obviously not the same person, but the cast definitely put a lot of themselves into their performances, and it’s easy to forget that what’s seen on-screen is just an actor playing a fantastical character. And that’s the reason TNG has stood the test of time. Even though it was basically the same thing as the Original Series, the ensemble cast ensured its continued legacy in the eyes of millions of viewers. And it didn’t hurt that the Borg were freaking awesome. In DS9, a Starfleet commander, Benjamin Sisko, is tasked with helping the crippled Bajoran people restore a space station to working order. This station was once owned by the Cardassians, who had tormented the Bajorans in an occupation lasting over half a century. A wormhole then opened near Bajor, and it was up to Sisko and Starfleet to make sure that the Cardassians didn’t take it for themselves. This wormhole was the “Celestial Temple” of a group of timeless and formless entities known as Prophets, the gods of Bajoran religion. Sisko became the Emissary of the Prophets to the Bajoran people, and unlike other Starfleet commanders, his destiny was directly linked to the supernatural. This allowed for a show full of religious allegories, moral issues, and more thought provoking moments than any other Star Trek show. Later on, Sisko was promoted to Captain, and he became instrumental to the destinies of the Federation, the Bajorans, the Klingon Empire, and the Cardassian Empire. 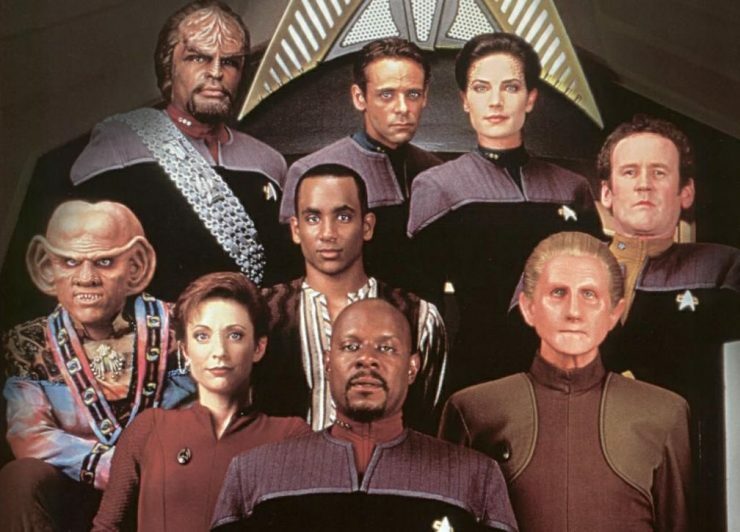 When it started in 1993, Deep Space Nine was seen as the black sheep of the Treks – it was too dark, too edgy, too different. In later seasons, it focused on war with the Gamma Quadrant, and this led to a level of Star Trek brutality not seen again until Star Trek: Discovery. In recent years, the show has seen a huge cult following. For many, the fact that it’s so different is precisely the reason why it’s the greatest of the Treks – and there are even a few people who consider it to be one of the best series in television history. DS9’s talented writers made sure that every episode was different, and the genres of TV programming offered by the series were interchanged at the drop of a hat. It could be a sitcom one episode, a romance another, and then a war episode after that. Thanks to writers and showrunners like Ira Steven Behr, it’s likely that the popularity of DS9 will only grow with each generation. With a wealth of character development, complex scripts, and some fantastic acting on the part of the ENTIRE cast, this could be a show that is watched for centuries to come- at least, it deserves to be. 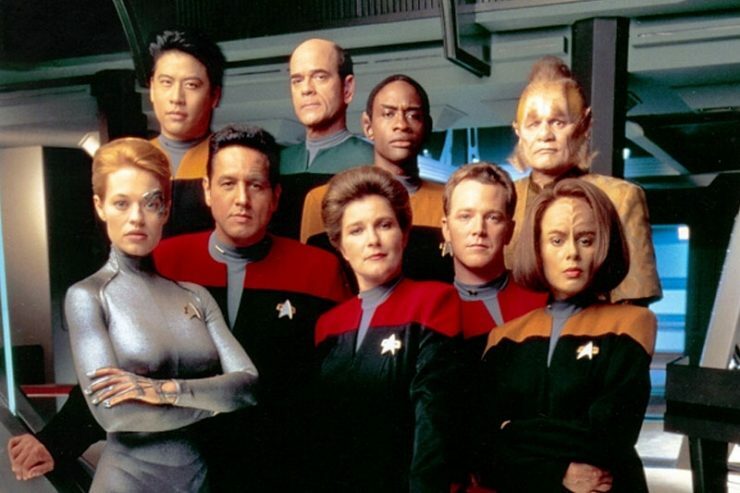 From 1995 to 2001, the most romantic of all the Treks played on UPN – Star Trek Voyager. Though there are certainly many references to relationships, it is actually romantic in the old sense of the word – as an epic story of a group of people facing insurmountable odds to find their way home. 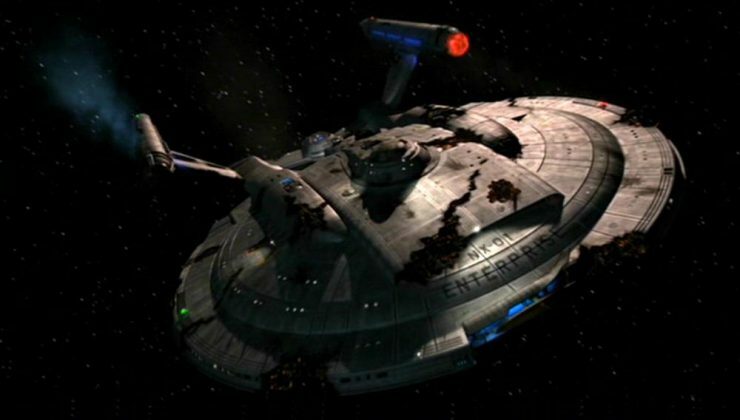 The crew of Voyager is lost in the Delta Quadrant, and they quickly learn that this part of space is more hostile and chaotic than their system of planets in the Alpha Quadrant. The process of returning home should have taken 70 years, but thanks to the crew’s strength and determination (along with a Borg conduit), they make it back to Earth in 7 years. For many, the best part of Voyager was a character introduced in season 4, Seven of Nine (Jeri Ryan). Liberated by the crew of Voyager, this former Borg skyrocketed the show’s ratings due to her striking appearance and impressive development as a character. Though she’s a badass with a mind even more analytical than a Vulcan’s, her heart is that of a lonely child, and her struggle to reclaim her humanity is believable and endearing. In addition to Seven, virtually all the characters of Voyager are interesting and well-developed, especially Janeway (Kate Mulgrew) and the Doctor (Robert Picardo). Janeway, the first woman to lead a Trek show as captain, is intelligent, cultured, and down to earth. Though she’s as tough as nails, she also cares deeply for her crew, and she follows her conscience even better than the captains in the other shows. The Doctor is a little harder to define, but his basic character arc is similar to Data’s progression in TNG – a machine, or in this case a computer program, trying to be human. 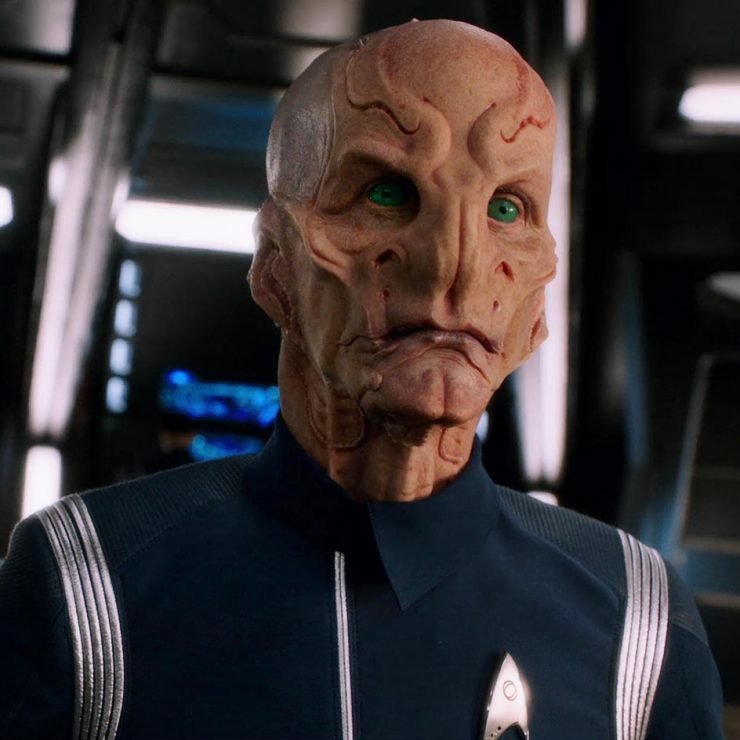 His quirky mannerisms, his growth as a sentient being, and his no-nonsense attitude make him both lovable and awkward, which is perfect for a Star Trek character (see Tilly in Discovery). 2001 saw an upgraded Trek featuring Quantum Leap’s Scott Bakula as Captain Jonathan Archer. The show was originally just called Enterprise in an attempt to attract non-Star Trek fans, but it was clear to everyone that it was set in the same universe and featured the same themes as the other shows. Enterprise was a prequel set 100 years before the Original Series, and it focused on the early development of the Starfleet organization. As a prequel, it stayed pretty close to the look of the other shows while updating all the special effects for a modern audience. Whether a Trek series is set in the 22nd or the 24th century, each one seems to reflect the time period of the real people who actually made it. This is mostly the case with Enterprise, but nostalgia for past decades creeps into nearly every frame. The characters, the sets, and the dialogue could have all come from the 1960’s, the period in which the first Trek was born (perhaps this is because the 60’s and the first decade of the 21st century were actually sort of similar, if you think about it). A fascinating element of the series was the precarious relationship between humans and Vulcans. The ruthlessly logical humanoids made contact with mankind when warp drive was reached by Zephram Cochrane, and though they guide humanity in their quest for further development, they also hold them back quite a bit. They refuse to share most of their own more advanced warp drive technology, and they also seem to look down on humanity as something below the Vulcanian species. Due to the humans’ uncontrolled emotions, the Vulcans seem to fear Starfleet’s desire for space travel – much to the chagrin of Archer and his crew. Enterprise was the only Star Trek series with a rock song in the intro. This divided fans – some missed the orchestral arrangements of previous Treks, while others thought that its inspirational lyrics fit the spirit of Trek like a glove. Star Trek fans were in for a huge treat (though not quite as huge as the Picard series planned for 2019). Created by Bryan Fuller and Alex Kurtzman, CBS All Access debuted Star Trek Discovery on September 24, 2017. It is the first Star Trek TV series in 12 years. The ratings went through the roof with an unprecedented amount of viewers, the reviewers sung its praises, and a new generation of Trekkies was created. So, what’s all the hype? Why has this show been so well-received? It’s very mature, for one thing. The character development happens very rapidly over just a few episodes rather than the multiple seasons it would take for another show, and it’s actually pulled off quite believably. Another great aspect of the series is the truly state-of-the-art special effects. Unfortunately, this is also its biggest drawback. It’s supposed to be set ten years before the Original Series, but all the tech used by the starship crews looks decades ahead of anything seen even in Voyager. This is obviously necessary, as time in the real world progresses to make film and TV look better, but it barely even bears a resemblance to the other Treks. There are, however, lots of sound effects from TOS that sneak in for nostalgia’s sake. The weirdest part of the changes is the Klingons. They look fantastic, but they are also a far cry from Worf in TNG. Hair and humor are gone. This could be explained by the fact that the Klingons in Discovery are part of a large cult not mentioned in the other shows, and the showrunners promise that the disciples of Kahless in the 2nd season will look more like the ones introduced in the Trek movies (not the ORIGINAL ones of TV – the Klingons of the Original Series, as any fan knows, looked more like humans than aliens). Discovery focuses on Michael Burnham, a Starfleet officer disgraced and imprisoned following her actions at the start of the Klingon-Federation war. Burnham recommended attacking the Klingons first, but her idea was rejected by the captain. Burnham then disabled the captain and took command, which made her a mutineer. The captain, Phillipa Georgiou, was later killed by the leader of the Klingon cult, T’Kuvma. Shortly after being imprisoned, Burnham is asked to serve on a state of the art Starfleet ship called the Discovery – a vessel of intrigue, lies, secrets, and a special technology that could turn the tides for the Federation in its war with the Klingons. In addition to the series, a short set of related anthology productions have been released once a month since October of 2018. These are called Short Treks, and just like the main series, the episodes have been hailed by critics and fans alike. The last short will be on January 3rd, 2019, leading up to Discovery’s season 2 premiere on on January 17th. What’s your favorite iteration of Star Trek? Let us know in the comments, and don’t forget to Let Your Geek Sideshow!